The valley of Gangtey is one of the most beautiful spots in Bhutan. The surprise of finding such a wide, flat valley without any trees after the hard climb through dense forests is augmented by an impression of vast space, and extremely rare experience in Bhutan where most of the valley’s are tightly enclosed. A few kilometers beyond the Gangtey Monastery, on the valley floor lies the village of Phobjikha. This place is the winter home of black necked cranes that migrate from the arid plains in the north to pass winter in milder and lower climate. Phobjikha, at an altitude of 2900 m, falls under the district of Wangduephodrang and lies on the periphery of the Black Mountain National Park. The valley boasts two beautiful meandering rivers, Nakay Chhu (Chhu Naap-black water) and Gay Chhu (Chhu Karp-white water). According to a local legend, the two rivers actually represent a snake and a boar. The two animals once raced each other with an agreement that if the snake (Nakay Chhu) won, Phobjikha valley would be able to grow rice, but if the boar won, then rice could never be cultivated in the area. The snake lost since it had to meander all the way during its journey. Rice cannot be cultivated in the valley even today. 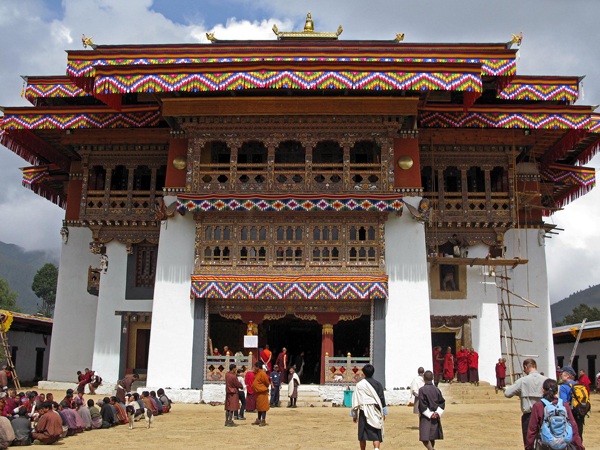 Gangtey is located in the Wangdue Phodrang District in central Bhutan. The Monastery, also known by the Gangten village that surrounds it. Bhutan&apos;s generally dry spring starts in early March and lasts until mid-April. Summer weather commences in mid-April with occasional showers and continues to late June. The heavier summer rains last from late June through late September which are more monsoonal along the southwest border. Autumn, from late September or early October to late November, follows the rainy season. It is characterized by bright, sunny days and some early snowfalls at higher elevations. From late November until March, winter sets in, with frost throughout much of the country and snowfall common above elevations of 3,000 meters. The winter northeast monsoon brings gale-force winds at the highest altitudes through high mountain passes, giving Bhutan its name - Drukyul, which in the Dzongkha language mean Land of the Thunder Dragon.